Mass-producing, mass-consuming humanity continues to leave its lasting mark on planet Earth. You’ve probably heard about the Great Pacific Garbage Patch, an “island” of floating debris in the north Pacific twice the size of Texas. While it isn’t always as large, and its debris is diffuse enough as to be nothing resembling an actual island, the Great Patch is still a great problem. And if one has formed in the middle of the ocean, might we expect other like patches to form closer to the coastlines from which the waste is dumped in the first place? They found one. Call it the Great Great Lakes Garbage Patch. In an expedition led by Lorena M. Rios Mendoza from the University of Wisconsin, Superior, researchers collected trash and fish from the Great Lakes. They found that, like the Pacific patch, the garbage in the Great Lakes is made up of huge amounts of tiny pieces of plastic. Of all the pieces collected by the research team in Lake Erie, 85 percent were smaller than two-tenths of an inch and a large proportion of those were microscopic. These small pieces often go unnoticed by passing humans, but not by the sea life that confuse them for food – an occurrence sadly confirmed by the large amounts of plastic particles found when the team dissected fish. The group counted between 1,500 and 1.7 million of these microscopic particles per square mile. The findings were presented at the American Chemical Society meeting in New Orleans earlier this month. Rios says the fish can be harmed either by eating the debris or by absorbing the chemicals that leach off the material into the water. She also said that the fish might not be the only ones being harmed. 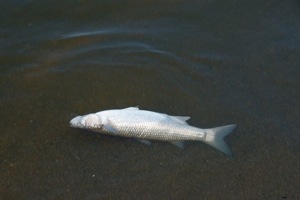 It has yet to be shown, but there’s a chance that harmful substances ingested by the fish might still be present when they come to market, or even in other lake animals further down the food chain. Research is ongoing to see if this is in fact the case. 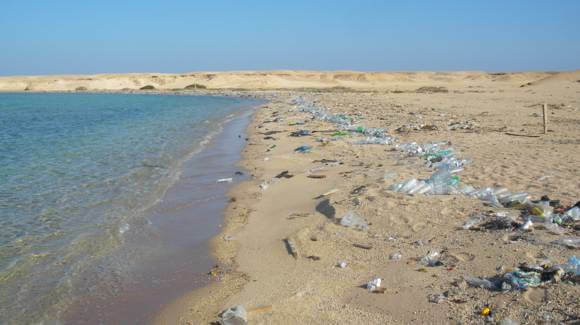 The problem of plastics in the world’s waterways has and continues to spread rapidly. According to Rios, plastic production has swelled by 500 percent since 1980, and today plastics constitute the bulk of ocean pollution, accounting for 80 to 90 percent. Plastic bags and bottles, and fishing lines make up much of the plastic, but the researchers also collected a large amount of plastic pellets that are shipped to factories around the world to be melted down and molded into all forms of product. The Great Lakes are the largest group of freshwater lakes in the world, accounting for 20 percent of the Earth’s freshwater surface. In addition to being “used as a garbage dump,” the National Wildlife Federation says the Lakes have been polluted with toxic chemicals from factory waste, agriculture and development near its shores. Like the Great Lakes and the north Pacific, the waters that hold the Great Barrier Reef in balance are being spoiled by human activity. Technology allows us to achieve great things – so many goods are made affordable, for example, by mass production. But when mass production is not responsibly planned out and regulated, trash starts piling up.